Our Boys of Summer, the 2011 World Series Champions St. Louis Cardinals, will play their first home game of the season at Busch Stadium tomorrow afternoon. 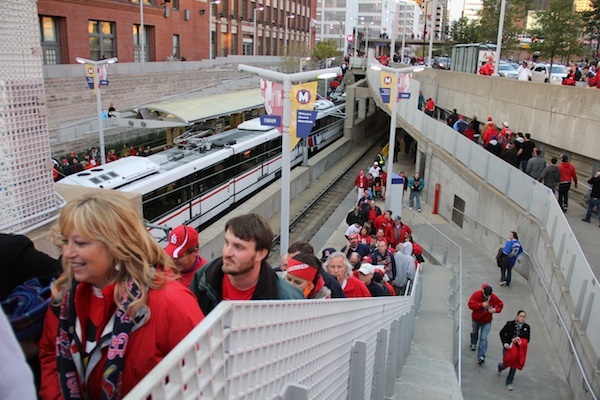 Since the Cardinals home opener is on a work day and parking in Downtown St. Louis will be at a premium, the best bet for Redbird fans (and Cubs fans) is to take MetroLink to the game and opening day festivities. To avoid the traffic, and the cost and hassle of finding parking, baseball fans can use one of the 19 free park-ride lots along the MetroLink line and take the train to the Stadium MetroLink Station or one of the other nearby MetroLink stations Downtown to join in on the fun at the rallies or to get something to eat before the game. Check our website for schedules and to find the closest park-ride lot to your home. Metro will have additional staff members on the MetroLink system tomorrow to assist baseball fans. Extra trains will be added, as needed, before and after the game. There are also plenty of MetroBus routes in Illinois and Missouri to get fans to Downtown St. Louis for the game tomorrow including the Redbird Express. It departs from the Water Tower at St. Clair Square in Fairview Heights, Illinois, with the first Redbird Express leaving 2 1/2 hours before the game and running every 5 to 10 minutes. Tomorrow for the home opener, the Redbird Express buses will begin running at 11 a.m. More information about the Redbird Express can be found at the St. Clair County Transit District website. We are looking forward to watching some great Cardinals baseball this season and getting you and your family and friends to the games. Go Cards!